A 20-8 opening period and a game high 26 points from Jenna Beattie were the big keys in a relatively easy 57-40 victory for Fury women against Glasgow University. The win keeps them in sixth spot in the Championship. 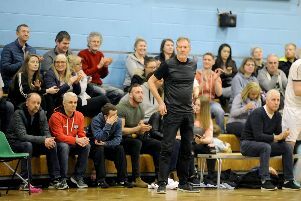 With Fury running their team throughout, the side included recent signing, former EBL player, Lauren Bennett and two Cadette players – Pelly Kidd and Emily Melrose. The game was an opportunity for the three of them to get valuable court time with the women’s side. Fury’s trapping defence troubled Glasgow, particularly in that first period where Beattie racked up nine points and Kirstie Young finished with seven. Beattie continued to put points on the board for Fury, scoring in all quarters, with fellow seniors, Kim Flockhart, Rebecca Lonsdale, Shannon Flippard and Ailie Gardiner all getting on the scoresheet alongside the two Cadettes Kidd and Melrose. Fury head coach John Bunyan spoke to the Falkirk Herald on the women’s comfortable victory after the game. “Our side has taken on a new look over the last couple of weeks,” he said. “It was good to see Emily and Pelly along with junior Katie McEwan who started, contributing so well. This Sunday at the NIA in Birmingham, the Glasgow Rocks face the London Lions in the final of the British Basketball League Cup. 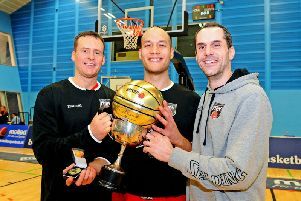 The Rocks have three former Fury stars in their line-up – Kieran Achara, Ali Fraser and Jonny Bunyan. The game will be live on BBC Sport and the Lions go in as the favorites. However, the Emirates Arena based side will be looking to pull off a cup shock and give the Rocks their first silverware in 15 years.